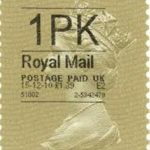 Facility for overseas customers to add postage in units of 50 pence, £1 and/or £5 Sterling. When amount has been advised by Regalia Manager, click on link to open Overseas Postage to proceed. Postage for overseas customers is charged at actual cost to the nearest 50 pence Sterling.